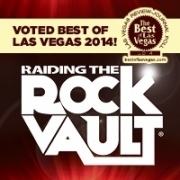 The Best of Las Vegas 2014! RAIDING THE ROCK VAULT brings the history of rock ‘n’ roll to life and pays homage to rock’s greatest hits from the ‘60s, ‘70s, and ‘80s. The music is played by an all-star super group of musicians, the likes of which is not seen anywhere in Las Vegas, and includes Rock and Roll Hall of Fame member Howard Leese [Guitar] (Heart), Doug Aldrich [Guitar] (Whitesnake, Dio), Robin McAuley [Lead Vocals] (MSG, Survivor), John Payne [Lead Vocals and Bass] (Asia), Paul Shortino [Lead Vocals] (Rough Cutt, Quiet Riot), Jay Schellen [Drums] (Badfinger, Asia), Andrew Freeman [Lead Vocals and Guitars] (Lynch Mob, The Offspring), and Michael T. Ross [Keyboards] (Lita Ford, Missing Persons). Two phenomenal female vocalists trade off duties for the show, as well: Carol-Lyn Liddle and Stephanie Calvert (Starship).